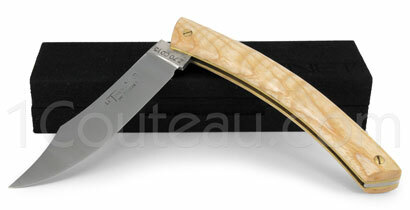 One of the first founders members of the "Confrérie du Couteau de Thiers" in 1993, Pierre Cognet created his own model of the Thiers, he was inspired from the celeb Douk-Douk. Z70CD15 Stainless steel forged blades lightly brushed, Rockwell harness 50/53, brass plates, full precious wooden handles, assembly with screw, total length of the knives: open 23cm, closed 13cm. All the « Thiers » must been marked with the logo of the Confrérie accompagned with the name of the manufacture. Finally, teachers visitors are empowered to monitor compliance with these rules from the manufacturer, which is a guarantee of quality for "The Thiers" and certify an authentic French manufacture.